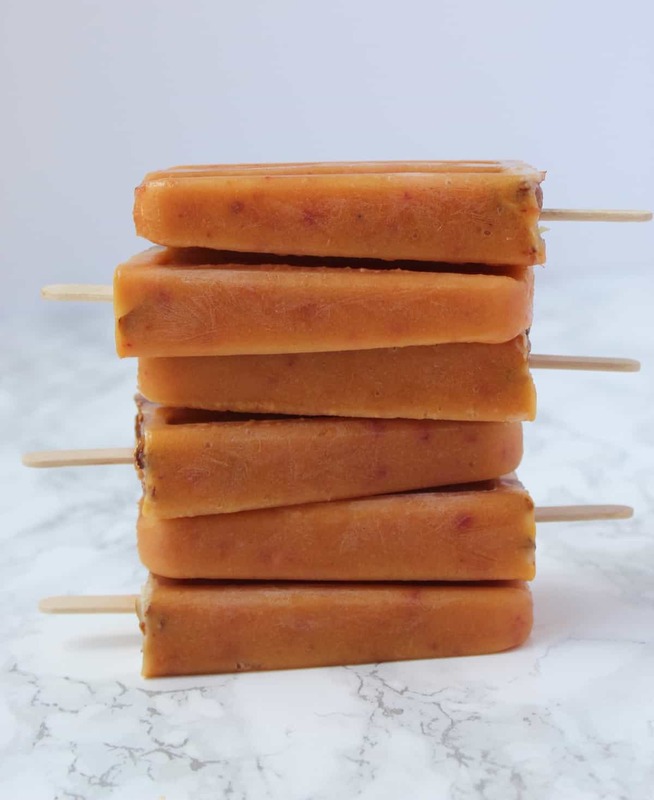 Popsicle lovers rejoice with these Ginger Peach Popsicles! 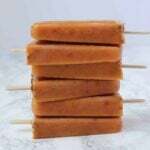 An easy summertime treat that is paleo, vegan, and has no added sweetener. If there is one thing I can always eat, it would be popsicles. Not the kind you find at the supermarket though. 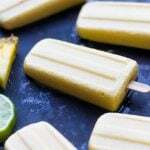 Fresh (and locally made if possible) popsicles with unique combinations are my favorite. 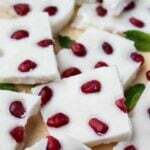 How can you go wrong with a healthy and refreshing treat? My boyfriend used to live in Charlottesville, VA and they had a cute farmers market on Saturday mornings. When I was visiting I would beg for us to go to the farmers market. They had everything from fresh and local fruits, veggies, and meat, donuts, homemade veggie burgers, and popsicles. Obviously the popsicles were my favorite part. I was the girl in the middle of winter with gloves on my hands eating popsicles. There is something nostalgic about them that brings you back to feeling like a kid again. 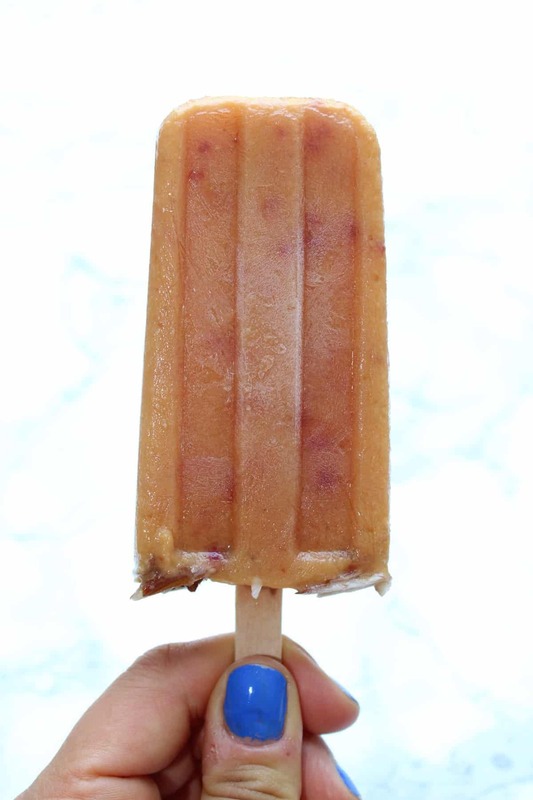 Did you know there was #popsicleweek on Instagram?! What better week could you think of. If you scroll through that hashtag there are some insane combos on there. I mean rainbow froyo & boba Thai iced tea?! Genius. I was in the midst of my Whole30 then so couldn’t participate. Horrible planning that was. So I figured I would join the party now. Better late than never right? 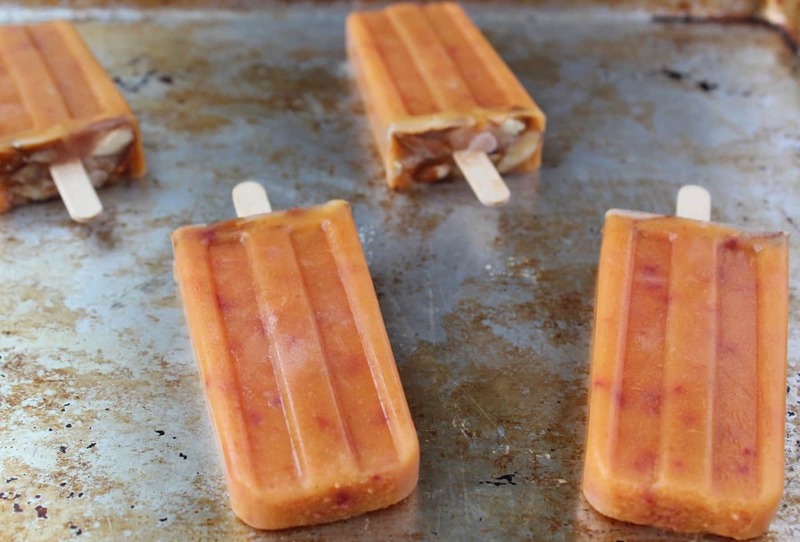 These ginger peach popsicles couldn’t be easier. Peaches are in season right now in Texas. Who knew Texas was known for peaches? Not me, until I moved here. All you need is peaches, ginger, and lite coconut milk. 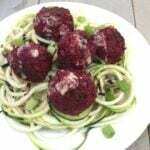 Throw it in your blender or food processor, and voila. I added some chopped almonds on the bottom for aesthetics effects, but they definitely aren’t needed. If you haven’t tried the peach and ginger combo you must! The sweet plus the spice the ginger gives. It’s like a party in your mouth! 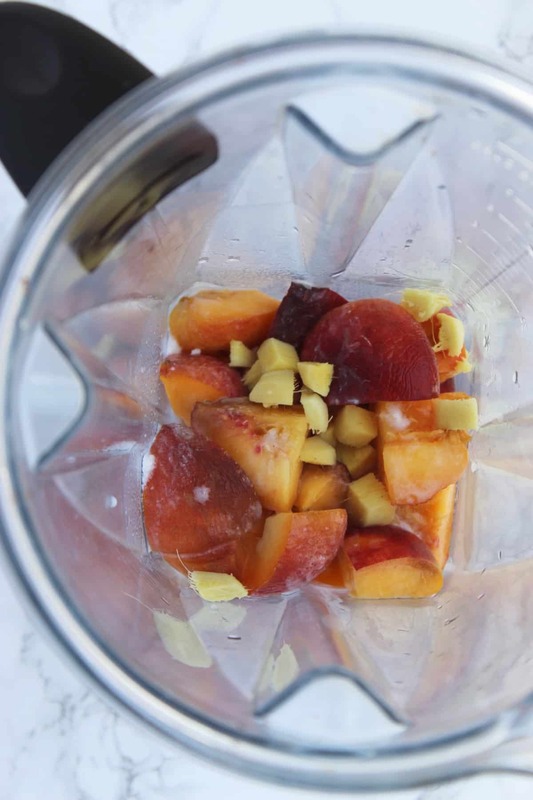 Place chopped peaches, ginger, and coconut milk in a high powered blender or food processor. Process until smooth and combined. 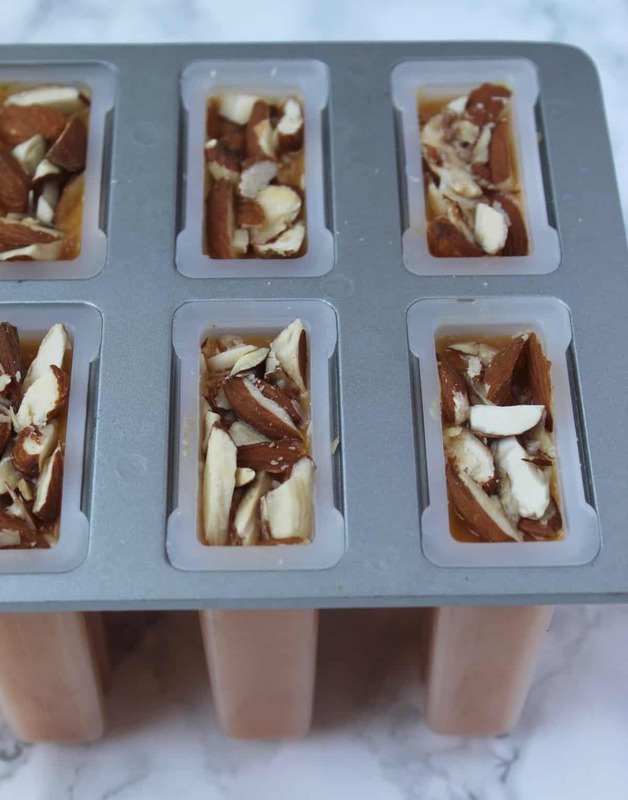 Pour in popsicle molds. 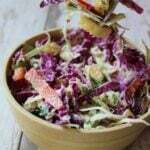 Top with chopped almonds if using. Place lid on molds and insert stick (or follow directions per your mold). Freeze for at least 3-4 hours. Enjoy! 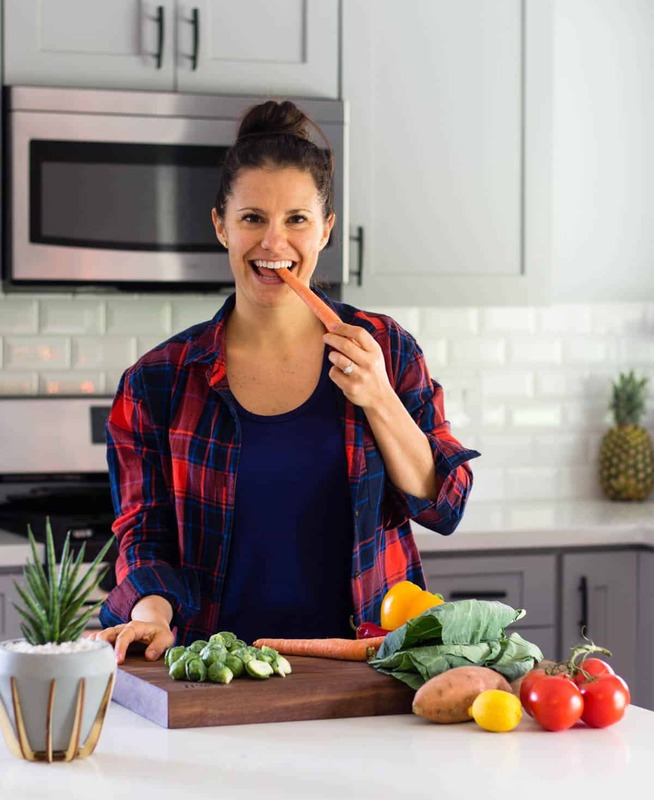 Are you a lover of popsicles? What is your favorite flavor? What flavor should I try to make next?